I love quick easy cookie recipes. Really, I just love cookies and I prefer homemade cookies to the store bought, processed, packaged type. The fastest way to have homemade cookies anytime you want them is to make a big batch and freeze them ahead. You can freeze cookies before or after baking them. Freezing cookie dough is great if you have time to bake when you're cravings hit or if you want to add that extra barrier between yourself and your next cookie and (hopefully) your hips. 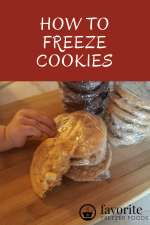 Frozen baked cookies can be warmed in the oven or microwave before serving and you get that fresh baked cookie smell too. If you're as impatient as me though you'll probably eat them ice cold. You can also freeze nuts to use in your recipes. This is a great way to save money on ingredients, plus freezing keeps nuts fresher longer. Here you'll find some of my quick and easy cookie recipes. You can also add your own cookie recipes or variations. Have A Great Cookie Recipe? Do you have a great cookie recipe or a favorite variation of a classic? Share it with us! Be sure to include baking time and temperature. TIP: Since most people scan Web pages, include your best thoughts in your first paragraph, this is the place to tell us why you love your cookie recipe. 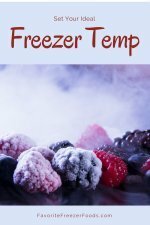 Return from Quick Easy Cookie Recipes to the homepage of Favorite Freezer Foods.